August 27th, 2012 - THE BEST "Black Triangle" 7" SHIPPING NOW!!!!!! 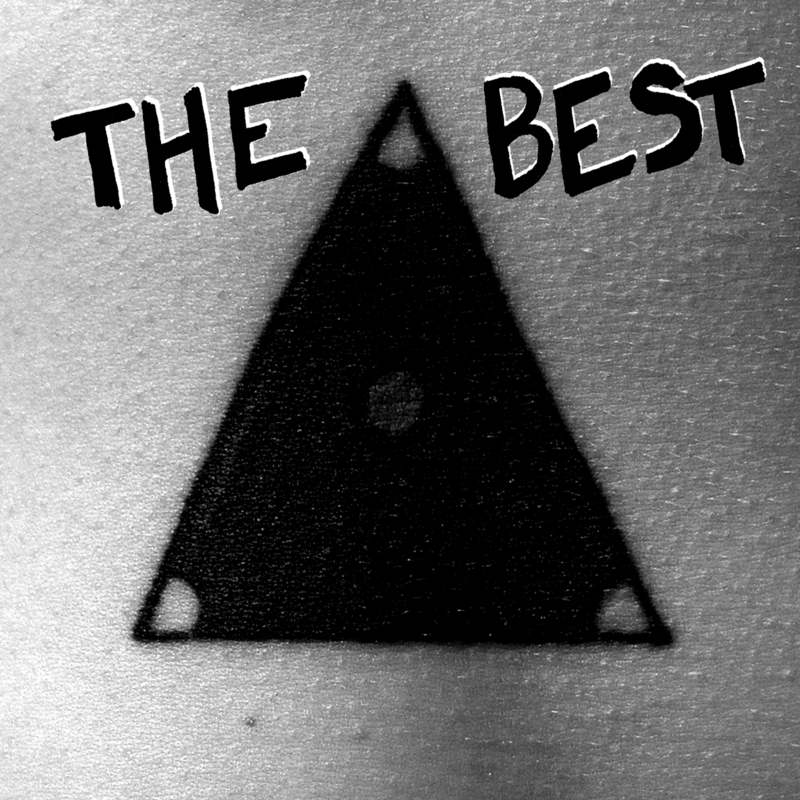 TWISTWORTHY RECORDS #14 - THE BEST "Black Triangle" 7"
The Best debut single, "Black Triangle" is available NOW. Click here for THE BEST. First: I'm a little behind on mail orders, as i've been traveling and just got back to Austin. Sorry about this - you'll receive your records soon! The Best are having a little record release party this Saturday August 25th for their debut single on Twistworthy Records. The 7" will be available at the show for purchase! Also playing are Weird Party (who will also be celebrating the recent release of their Twistworthy Records jammer "The Secret Lives Of Men"! This show will be at Spiderhouse Stage/Bar, and NOT at the Ballroom (as was previously announced), so it's gonna be extra fun, like having a full bar at a house show. Twistworthy Records is happy to announce the return of Camp X-Ray! Playing countless shows after the formation of the band in 2004 (including support slots with the likes of Lungfish, The Constantines, Naked Raygun, Wrangler Brutes, Toys That Kill, Matt & Kim as well as playing Fun Fun Fun Fest), CXR finally released their debut s/t 7" on Twistworthy Records during the summer of 2008 to favorable reviews. 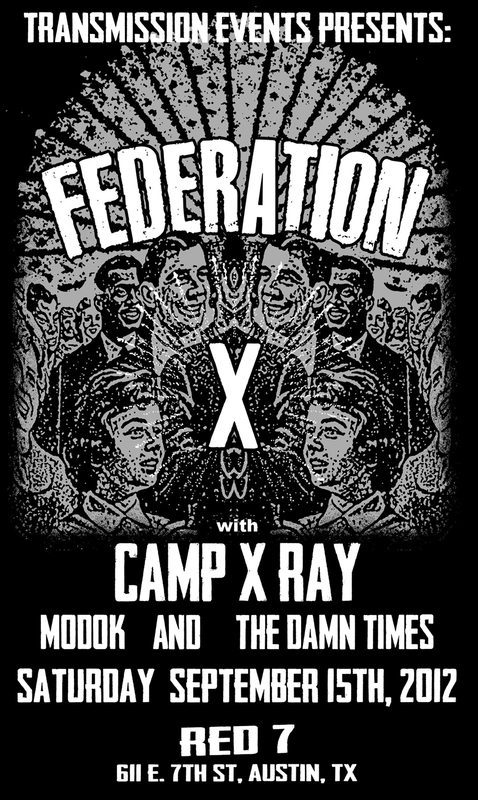 The band broke up in 2009, but has now resurfaced again in 2012, and will return to action opening for one of our all-time favorites, Federation X from Bellingham, WA. This show is not to be missed! July 16th, 2012: FLESH LIGHTS tour SHOW REVIEWS! 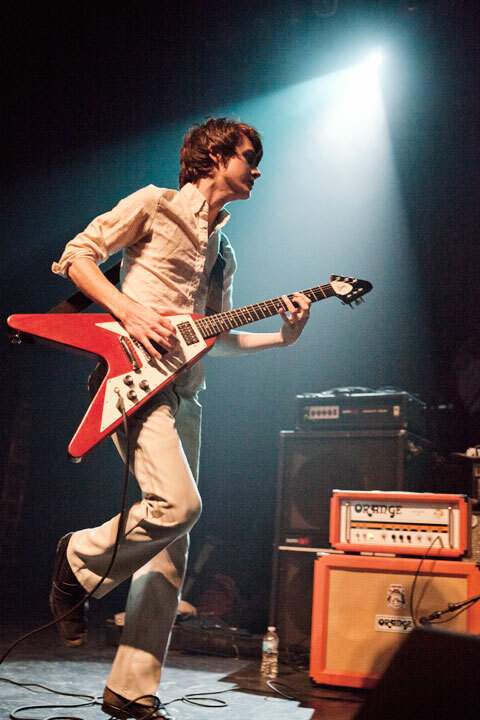 First things first, there's some good pics on Brooklyn Vegan from the Chicago show, here. Everything else that follows, below, are direct quotes from various reviews around the internet world. "Two bands opened the show, starting with a trio called Flesh Points (sic) from Austin, TX. They were impressive in their aggression and volume, but the lack of obvious melody in their songs reminded me how special bands like The Ramones, The Clash, Husker Du, Nirvana and Green Day were in their ability to blend noise and speed with enjoyable ear candy." -via this guy. "Before they could take the stage though, the audience had to sit through the opening acts. Flesh Lights from Austin, Texas, played straight punk rock. They group traded off vocals between all three members quite successfully. And their rather grotesque name was reflected in their fast-and-dirty songs. However, it was hard to take a punk band seriously when the guitarist/singer is dressed in a button-down green shirt, well-tailored jeans and Kings Of Leon-esque shoes; that's a look for a Bright Eyes opener. And, if the middle school "punks" I knew taught me anything, attitude and look is more important than anything else." -via acrn.com. If any of the people who wrote these reviews want to check out "Muscle Pop" CD/LP by the Flesh Lights and give it a fair shake, get in touch and i'll hook you up. You're looking at the newly designed site. Gone are the days of struggling my way through attempting to write html manually (aka copying everything from other sites), fucked up borders, Paypal buttons that I cannot line up correctly to save my life, and everything else that was wrong with the old site. Finally. I think people will like this and find it easy to use. Built in carts are nice, as well as almost every release being streamable from the store page - just find the store page of the record you want to hear and you can stream the whole thing before you buy. I have a little work to do with the photo gallery and some other pages that i'll be adding... but I wanted to get things rolling here first, and those updates will follow. Flesh Lights are currently tearing up the east coast, playing shows with The Hives with a few non-Hives shows along the way. I've been told that they're playing in front of anywhere from 500-1000 people every night and people are loving it. Go see them if they haven't hit your town yet - they're on tour through July 2nd.... dates below. WEIRD PARTY 7" OUT NOW! 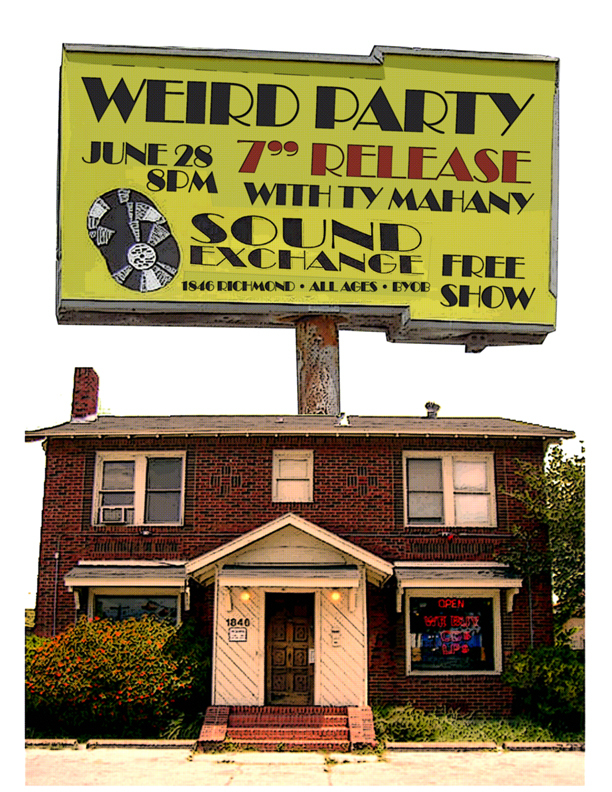 We're having a little 7" Record Release party at SOUND EXCHANGE records in Houston TX on Thursday, June 28th. You should come, it will be a nice, intimate time. The opening act for this special show is none other than funny man, Ty Mahany. Texas rockers Weird Party return with their second single Secret Lives of Menon Twistworthy Records, which features four new cuts this time around. Comprising mostly of former members of Fatal Flying Guilloteens and Sugar Shack, it’s undoubtedly always going to be a bit of a raucous affair when dealing with Weird Party. I recall on their debut single that they seemed to represent themselves with a sound more so leaning towards the FFG days, which was fine and all because they were definitely awesome, but I worried about them moving forward as such. It’s good to hear the band basically coming together here and venturing down a much more bluesy type of garage-rock path, with a couple dirty sounding burners that definitely give the sense that if you were to be hanging with these guys on any given night that it would spell drunken trouble. The final track on the b-side “Birth Spasms” seems to be doing it for me, with an added sense of evil thanks to a sampled in maniacal laugh during parts of the song. Like the energy here, and I imagine seeing these dudes live would be a pretty good time. Buy yourself a copy of the record here. Or two.